"When we freed her, she couldn’t stop jumping up and down and giving hugs." Earlier this month, staff at Stray Rescue of St. Louis received a call that broke their hearts. It was from a new homeowner who was getting ready to move into his new place. 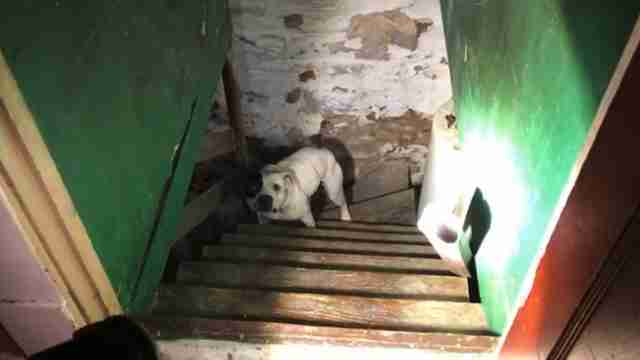 "I just bought a house and there is a pit bull chained up in the basement," he said. "I'm not sure how long it's been down there." Rescuers rushed to the home, where, they were told, a squatter had been staying some time earlier — leaving behind garbage, debris ... and a precious life all alone in the dark and cold. 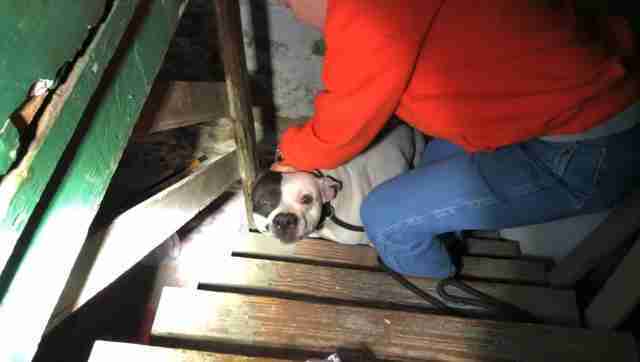 Fortunately, the poor pup had been found in time to be saved. And she couldn't have been happier about it. "When we opened the door to the basement and shined our flashlight down, we saw a wagging tail," Natalie Thomson, the group's communications director, told The Dodo. "She was nearly choking herself as she was so excited to see us. When we freed her, she couldn’t stop jumping up and down and giving hugs." No one knows who left the dog behind or why, but it was clear she wouldn't have lasted much longer. "There was no food or water bowls that we could see," Thomson said. "She was not spayed and had no microchip." But at least now she was safe, and she knew it: "Due to her excitement, we named her Jumping Bean!" Here's video of the moment Jumping Bean was rescued, and a peek at the happier life that now awaits her. What makes the lonely and confining situation Jumping Bean was found in all the worse is the fact that she has such an uncontainable zest for life — and her eagerness to be loved. "Her personality is completely adorable," Thomson said. "She loves everyone she meets and craves attention. She makes sure she is not ignored! She’s an energetic and very affectionate pup! She is so happy all the time." 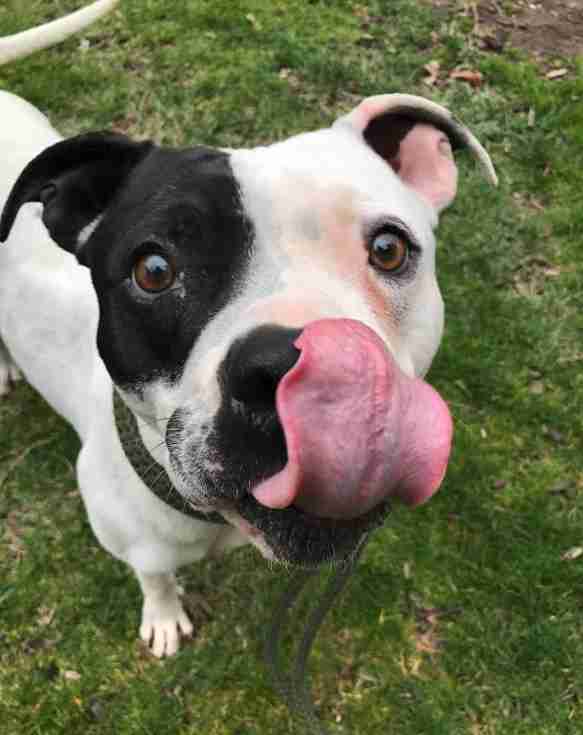 To learn more about Jumping Bean, or to make a donation supporting rescues like this one, visit Stray Rescue of St. Louis online.